When it comes to seating a crowd, nothing rises to the challenge like a hardworking banquette. Whether paired with a stately dining room table or a tiny breakfast table, a banquette brings a cozy, homey feeling to any space. But those buying a new banquette know the task comes with not a little sticker shock. However, some rather resourceful and industrious bloggers prove you don’t need to spend an arm and a leg to get the look. This month we’re featuring some of our DIY banquettes from around the web in the Bob Vila Thumbs Up competition. 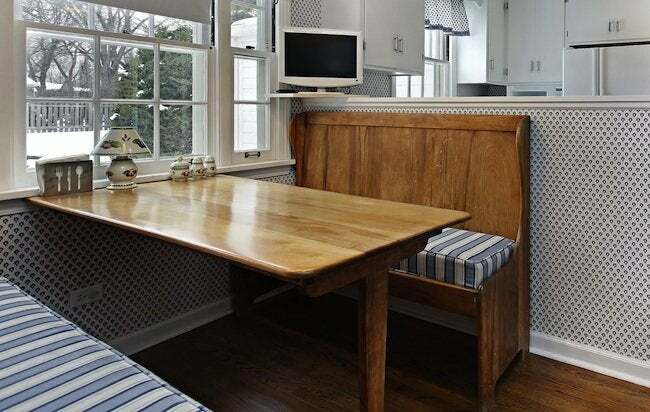 Bob Vila Thumbs Up highlights some of the best and brightest DIY bloggers, and this month we’re excited to share four amazing banquette seating projects. Though each banquette serves the same purpose, providing well-designed seating, every one comes together in a totally unique way. They all win points in our book but we’re counting on you to help us name one blogger as the champion of this month’s competition and the prize—a $250 gift card. So cast your vote today and every day in October to help your favorite blogger become this month’s Bob Vila Thumbs Up winner. After all, it’s your vote that determines the outcome of this competition. Congrats to last month’s winning blogger, Brooklyn Limestone. Read more about the winning Bob Vila Thumbs Up project right here.